This paper presents the stabilization effects of inorganic filler, cerium-doped lead zirconate titanate on high-density polyethylene. The filler was loaded in two concentrations (1 and 3 wt%). The dopant contents in PbZrO3 were 0, 0.05, 0.075, 0.1 and 0.125 mol%. The degradation of hybrid samples was accomplished by γ-irradiation at various doses up to 200 kGy. 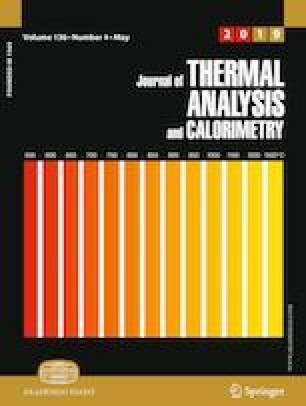 The isothermal and nonisothermal chemiluminescence (CL) and thermal analysis (TG-DSC) were applied for the thermal stability characterization of modified HDPE samples. The mechanistic considerations and radiochemical consequences caused by the variation of filler concentration and doping level are discussed. The results demonstrate that the filler acts efficiently as stabilizer at low concentration of additive when the lower filler amount is present. The start of degradation precedes melting by four processes through which the chain scission and radical oxidation represent the essential degradation stage. The filler concentration influences the degradation due to the intimate interaction between solid-state defects and free radicals. The polymer protection against oxidation is based on the scavenging of radicals by the doping elements, that is, they trap and block radicals delaying material aging. The present results open a new perspective in the quality amelioration of organic products toward high durability. The online version of this article ( https://doi.org/10.1007/s10973-019-08216-6) contains supplementary material, which is available to authorized users.